SSC Stenographer 2018 Exam – Staff Selection Commission (SSC) has declared the SSC Stenographer Result 2018 and CBT cut off marks for Grade C and Grade D post on April 15, 2019. The result and cut off marks has been released on the official website i.e. ssc.nic.in. The candidates who have appeared in the examination can now check their result. 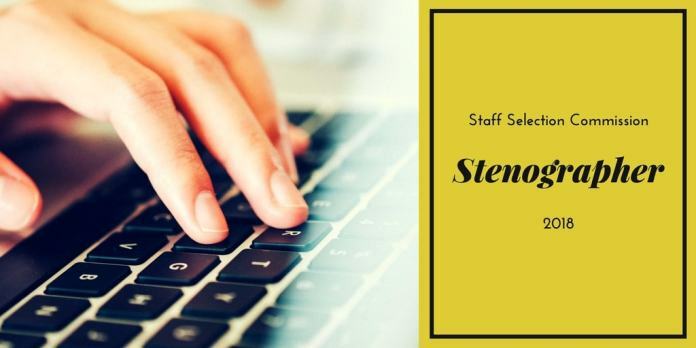 The vacancies of SSC Stenographer 2018 exam has been released on April 12, 2019. 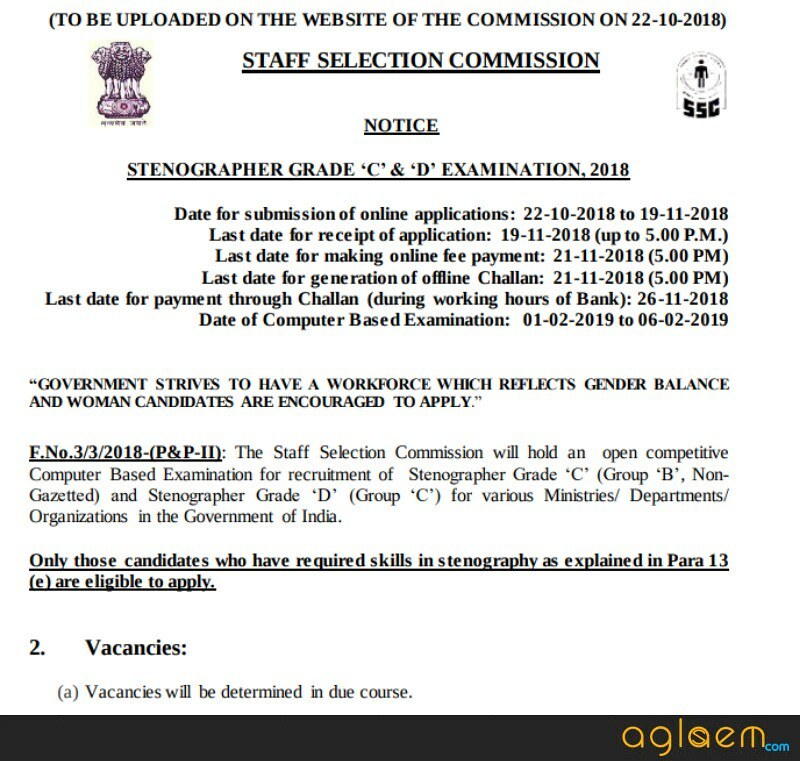 The selection procedure of SSC Stenographer 2018 includes Computer Based Test and Skill Test. Get here complete details of SSC Stenographer 2018 Exam. Latest: SSC has announced SSC Stenographer Written Examination Result 2018 and cut off marks. Click here to check the same. Every year lakhs of candidates apply for the SSC Stenographer 2018 Exam. If we analyze last year data 2,24,618 candidates appeared for the exam and at last 8469 candidates were qualified for Grade C while 15004 candidates were qualified for Grade D. This year Computer Based Examination will hold on September 04 to 08, 2018. The SSC releases the vacancies of SSC Stenographer 2018, via a notice. There are total 1201 vacancies. In all 505 vacancies are for SSC Stenographer Grade ‘C’ and 696 are reserved for SSC Stenographer Grade ‘D’. The Answer Key of SSC Stenographer 2018 examination is available on this website as well as an official website. Answer Key is very important for candidates. SSC uploaded the answer key at ssc.nic.in. The answer key has been released for a Computer Based Examination and it is tentative. The final answer key will be released after taking the objections on SSC Stenographer Answer Key 2018. SSC is conducting the re-exam for the first Shift of examination held on February 05, 2019. 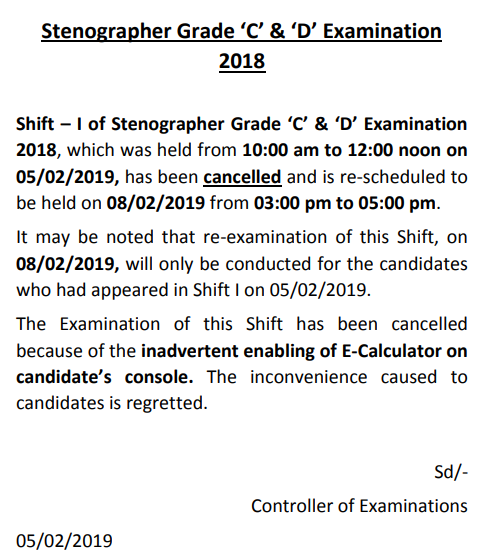 SSC has canceled the exam due to the enabling of e-calculator on the candidate’s console. The candidates are not allowed to use the calculator. Now the examination will be held again as per the schedule provided above. Staff selection commission is going to conduct examination for recruitment to government Stenographer posts. The admit card for the SSC Stenographer 2018 has been updated on the official website of SSC. The candidate who has applied for the post can download the admit card for the Computer Based Examination, and those who will clear the CBT will be issued the Admit Card for Skill Test. The candidates can download the admit card on the commission’s website, or they can download the same on the “Admit card” page. The Admit Card will be released region wise, so the candidates have to click on the region wise link in order to download the admit card. The application process of SSC Stenographer was open as per the schedule. The candidates who were interested in filling the application form. The candidates should note that. the dates for applying and submitting the application fee is different. The application forms were available on the official website of SSC i.e. ssc.nic.in. The application form had some steps. Step 1 is Registration, Step 2 is the Application form filling & Payment of Fee, Step -3 is final which is printing application form. After attempting all the steps the Application process completed. Skipping any step can cause Application Rejection. Try to fill application form accurately, as SSC will not provide any chance to modify details on the application form. Rs. 100/- for Unreserved Candidates. The candidates falling under Woman, SC / ST, Ex-Serviceman Category were exempted from payment of the fee. The fee was Non – Refundable. or a person of Indian origin who has migrated from Pakistan, Myanmar, Sri Lanka, East African countries of Kenya, Uganda, the United Republic of Tanzania(Formerly Tanganyika 2 and Zanzibar), Zambia, Malawi, Zaire, Ethiopia and Vietnam with the intention of permanently settling in India. The candidate must have passed Senior Secondary Examination or equivalent from a recognized Board or University. Age Limit: The candidates must be 18 – 30 years and 18 – 27 years as on January 01, 2019 for the post of Stenographer Grade ‘C’ and Stenographer Grade ‘D’ respectively. Age Relaxation: There is some sort of age relaxation policy which is applied to this post. For SC/ST candidates the age relaxation is up to maximum 5 years. For OBC candidates the age relaxation is up to 3 years. In this context, the Physically Handicapped candidates, (OBC 13 years, SC/ST 15 years, General 10 years). A candidate with Hearing Impairment is not eligible for SSC Stenographer 2018. Check more about eligibility on “Eligibility page“. From below candidates can see the detailed exam pattern for SSC Stenographer 2018. Exam Pattern helps the candidates to know about the duration of the examination, question types, marking scheme etc. There will be a computer-based examination. Questions asked would be multiple choice questions. Except for Part III, questions will be in English and Hindi. There will also be a negative marking of 0.25 marks for the wrong answer. Stenography test will be of qualifying in nature. Only those candidates will appear in Steno Skill Test 2018, who will get qualifying marks in the computer-based examination. Candidates will sit for a skill test. 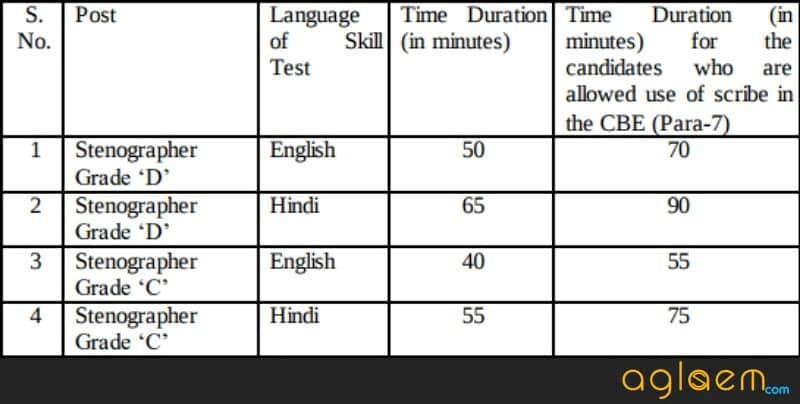 wherein they will be given a dictation for 10 minutes in English / Hindi at 100 wpm (for Grade C) and 80 wpm (for Grade D). The dictated matter will have to be typed on the computer. The selection process comprises two steps, the First step is Computer Based Test and the Second one is the Skill Test. CBT is consisting of objective type question. Commission set the provision for negative marking in CBT. The candidate who will appear for the CBT and obtain minimum qualifying marks will have to appear for the next step Skill Test. Skill test is the next step of the selection process, in which the candidates have to type the dictated matter on the computer. The candidates have to type the dictated matter in a given time frame. At last, those who will clear Paper I, II and Document verification round will get the confirmation letter. SSC will put them for a probation period of two years. On completion of the probation period, candidates will get the permanent appointment. SSC will compile the Final merit list after the declaration of Result. SSC will prepare the merit list on the basis of candidate’s performance in Computer Based Test and Skill Test. The candidates have to perform well in both of the Tests. SSC will appoint the candidates on different departments according to their position in the merit list. While compiling the merit list SCC will resolve the tie if two or more candidates will obtain the same marks. SSC will opt these methods to resolve the tie. If tie found then the candidate with more Marks in a Computer Based Examination will get preference. If the tie still exists then the candidate with more Marks in Paper II will be preferred. If a tie still persists the older age candidate will get the preference. At last, if the tie remains same then SSC will follow the Alphabetical order.